Spring is here, the days are longer, and the weather is getting warmer. That means that many people will start riding their bicycles again. Unfortunately, many bike riders will be involved in motor vehicle accidents while they are riding. If this happens to you, it is important that you obtain legal representation as soon after the accident as you can. At Worby Groner Edelman, our White Plains motor vehicle accident attorneys have decades of experience representing clients injured in bicycle accidents. Of course, there are a few common sense precautions that you can follow to avoid a bicycle accident, or to minimize your damage if one occurs. Many municipalities have laws that require all bike riders to wear a safety helmet. You should wear one even if not required to do so. Also, stay to the right of the road, or better yet ride within a dedicated bicycle lane if one is available. If you are involved in an accident, try and call 911 on your cell phone (which you should always have with you while riding, in case of an emergency). Getting the police involved will ensure that a police report will be taken, and you will be able to identify the operator of the vehicle that hit you. By doing so, you will also be able to obtain that vehicle’s insurance information. By law, the insurance company for the vehicle that hit you is required to pay your medical bills, even if the accident was partially or entirely your own fault. That insurance company may also be responsible for partial payment of any salary that you lose if you are out of work. Of course, if your injury is sufficiently serious, you may be entitled to monetary damages over and above payment of your medical bills. While many bicycle enthusiasts ride in a responsible manner, there are those who operate recklessly, on crowded sidewalks. If you are a pedestrian hit by a bike, the law protects you too. Make sure you obtain information to identify the rider who hit you. In that circumstance, you might have a claim against the bike rider’s homeowner’s insurance company. The easiest way to identify the bicyclist so that a future claim can be made is to call 911, so that a report can be taken when the police arrive. If you are in a bicycle accident, contact Worby Groner Edelman LLP for a free, no obligation consultation. 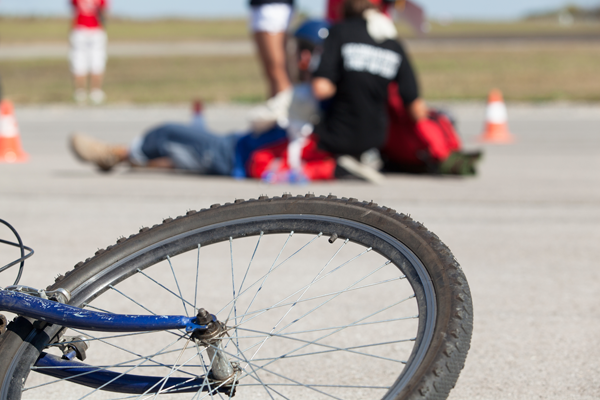 Our White Plains accident attorneys have extensive experience in bicycle accident cases. We will answer all of your questions, help you process your medical bills and sort out any available insurance coverage. We will handle your case efficiently, and move your case to resolution in a prompt manner. We will do everything possible to settle your case for the right dollar amount, but we will simultaneously prepare your case for trial so that if the insurance company will not settle the case for a fair figure, we will be prepared to try your case.